Provide a container of long pipe cleaners, black if possible, and large and small balls of modeling material. Demonstrate how to stick the pipe cleaner into a ball to make it stand up vertically. Ask the children to create different kinds of interesting lines. A child with a strength in this area will create different kinds of interesting lines. He may stick them all in one large ball or in separate little balls. One is not better than the other, just notate what he does. Some children will stick many, many pipe cleaners into a large ball or small balls, indicating a possible interest in rhythm, texture or space. Notice how they are arranged—randomly, in some order, etc. Some children will not attempt to bend the pipe cleaners, which may indicate an interest in straight lines or rhythm. Children who are more interested in shape, may make the pipe cleaners into shapes or change the shape of the clay ball. 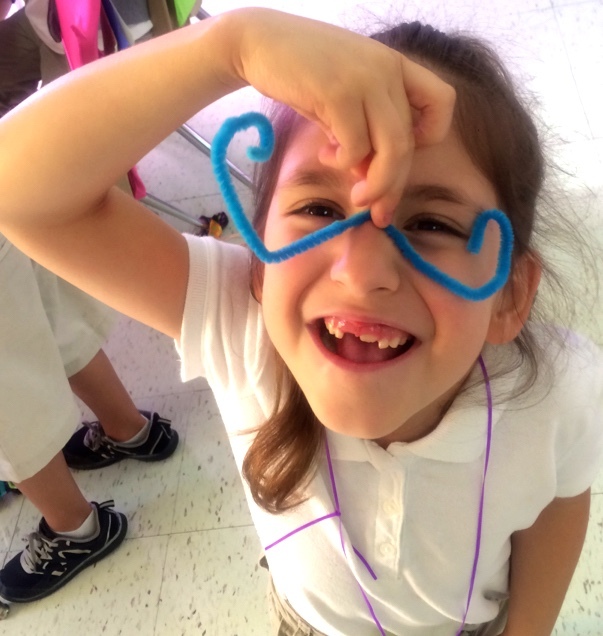 Children who have an interest in color, may ask for different colors of pipe cleaners or may put small pieces of colored paper on the ends of their pipe cleaners. .
Children who have an interest in light, may want pipe cleaners that glitter or ask for aluminum foil to add to their lines. A child who likes texture will find a way to add texture. A child who makes curvy lines may also have an interest in movement. 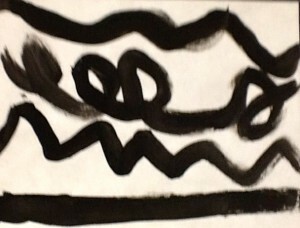 Give each student a long piece of adding machine paper and either a black marker or a small brush and black tempera. Ask students to make a long line to show how they feel that day. A child with a line strength will create an interesting line. A child with an interest in shapes may make them instead or create very fat lines. A child that makes dots or other patterns may have a strength in rhythm. A smooth flowing line may indicate a child interested in movement. 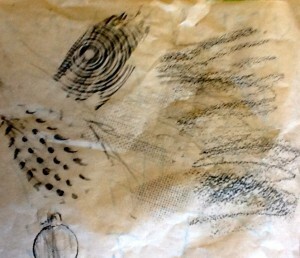 A child who loves texture may create scribbles or dense patterns. A child with an unusual interpretation of the assignment may have strengths elsewhere. Cover tables with plastic tablecloths or drop cloths. Give children old shirts to wear over and protect their clothes. Give each child a paper plate with shaving cream spread on it. (Make sure they know not to eat it!) Alternative: Use brushes and tempera. Ask children to use a finger to transfer colors to their plates and mix them to make new colors. 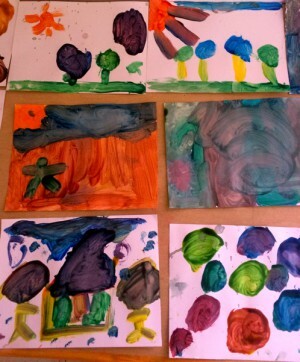 A child who actually discovers orange, green, and/or purple may have a strong color sense. A child who quickly mixes colors until their plate looks muddy may be stronger in texture or movement than color. A child who does not mix the colors at all may be stronger in other areas and/or have an aversion to the texture of the shaving cream. Give each child a piece of wax paper stapled to a cardboard frame. Give children a random assortment of tissue paper shapes to choose from. Give each child a tiny amount of glue and a brush. Demonstrate how to brush a small amount of glue on a tissue paper piece and glue it to the wax paper. Allow children to glue as many or few pieces as desired. The teacher does not make any suggestions. Hang or place suncatchers in windows where the sun can shine through them. A child who overlaps colors to create new colors in an aesthetically-pleasing way may have a strength in this area. A child who doesn’t overlap colors at all may like colors but just not mixing them. 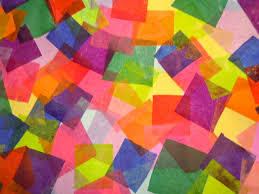 A child who uses just one or a few colors may still have an interest in color or they may like shape or other elements. 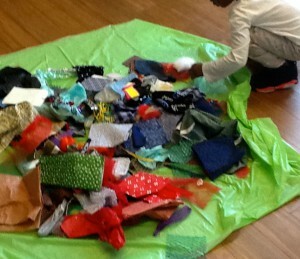 A child who leaves almost no white space or who scrunches the tissue paper a lot may like texture more than color. A child who carefully chooses interesting shapes may like shape more than color. A child who creates many layers or 3D extensions may be stronger in 3D thinking. A child who creates interesting patterns with the tissue paper may have a strong visual rhythm sense. 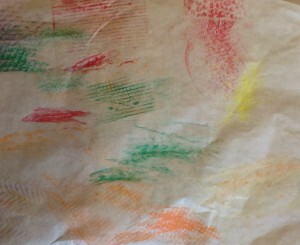 Show children how to place thin paper over a textured surface and then rub the paper with a crayon to make a rubbing. Give children an opportunity to find and create rubbings in the environment. A child who really loves this activity may produce more rubbings than anyone. This child may make rubbings of paint textures on a wall, patterns on the bottoms of athletic shoes and other locales missed by the others. May seem disinterested or produce only one rubbing. May rub so vigorously that they tear the paper, which might indicate a movement strength. Might be more concerned with the colors of the rubbings or mix colors on their rubbing, which may indicate a color strength. Provide children with little cardboard squares and an abundance of different kinds of textures. Encourage children to glue things they like onto their square. Children are allowed to do as many squares as they wish. Photograph each child with their square. Take a photo of the result. Children whose squares are interesting to touch, e.g. because they used cotton or sandpaper or another strong texture may have a strength in this area. They may do more squares than others. May have squares that are not tactile but have interesting visual textures. May glue one or two things on a square and be done with it. May use interesting colors, shapes, lines or other qualities indicating a different strength.